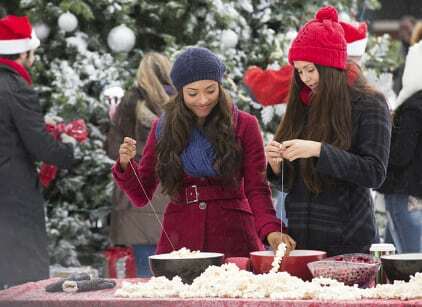 On The Vampire Diaries Season 6 Episode 10 Chrismas comes to Mystic Falls and Whitmore College. Jo comes face to face with her brother who steals her blood after he stabbed several people. Damon, Alaric, and Elena want to find Kai and kill him while Tyler tries to convince Liv and Luke to keep Kai alive. Elena and Damon continue searching for a way to rebuild an Ascendant so they can rescue Bonnie. When Damon realizes Kai has Jo, he goes to Luke for help. Damon and Alaric don't kill Kai because Jo decides she can beat him in the merge ceremony. Kai learns that Mystuc Falls was spelled by Travelers and uses that to his advantage. Sheriff Forbes surprises Caroline by bringing Christmas to her dorm room. Caroline doesn't appreciate Stefan crashing her holiday but he believes he's trying to make amends. Their fight is cut short when Sheriff Forbes collapses. They receive unsettling news at the hospital. Jeremy and Matt hunt Enzo by luring him to a cellar with information about Sarah Salvatore. When Matt wants to torture Enzo, Jeremy tells him that mentality will eventually get him killed. Matt persists with his desire to drive Enzo over the border. Bonnie tries to recreate her favorite holiday while alone in the prison world and remembers spending the season with her best friends.